forum.funcube.org.uk • View topic - Two instances of Dashboard on one dongle?? will Dashboard work running two instances of the program, one for Funcube-1 and one for UKUBE-1/Funcube-2 with one dongle? I have the two instances running which appear to be simultaneously using my one dongle but have not yet tried this on live data. Is this likely to work properly and will it have any drawbacks? Re: Two instances of Dashboard on one dongle?? Tried it - both seemed to work but did not upload from the first intance. The mode settings of the second instance seems to be applied to both instances. The "trick" to more than one instance on the same dongle is use "Capture from Funcube Dongle" on only one instance, let's call it the primary--and then for all subsequent instances of Dashboard, use "Capture from Soundcard." The primary instance will be the one to set the actual frequency of the dongle. The secondary, and beyond, won't control the frequency, but you can set the auto tune ranges, etc. Hope that's clear...try it and it'll become more obvious. Thanks Mark. That makes sense. I will try it. Another alternative that I'm going try tonight is to set up Dashboard for Funcube-1 and arrange my autotune limits to cover the entire Funcube-1 and UKube-1 frequency range. Thus just running one instance. I think Dashboard will still try to upload to the warehouse when receiving UKube-1/Funcube-2 data but not sure the warehouse it will accept the data. Problem solved. No need for two instances of Dashboard. 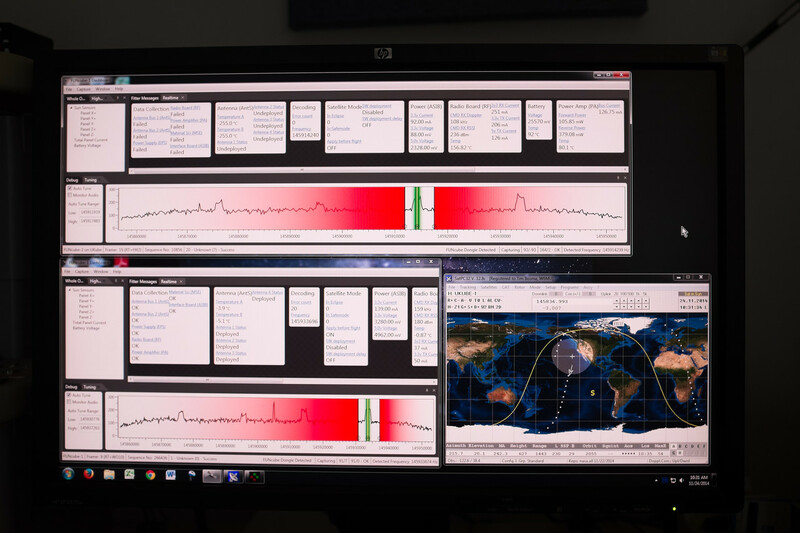 All the data received from both satellites is sent up correctly to the warehouse. I needed to set the autotune range to cover 145910 to 145944 to cover the doppler shifts of both satellites. The only problem with this was a big spike in the range due to FCD centre frequency which confused autotune. I overcame that by setting the FCD centre frequency outside the range (145900kHz in setup menu). Simples! With SatPC32 controlling the antenna (only 3+3 crossed due to space in the attic) and dashboard set up this way I now have full unattended capability. I was able to do the same thing again this morning. There's a screen shot here of 18:22 UTC pass here: http://tjb.smugmug.com/Amateur-Radio/Cu ... n-1-X2.jpg The upper window is UKube1, the lower window is AO-73. At the end of the pass it captured 119 frames from UKube1 and 121 frames from AO-73. My QTH is in a valley on the north slope of a mountain and I have anywhere from 6 to 9 degrees of obscuration from the ridges around my place, otherwise the numbers would have been better. Sady, this did not work for me, as I have some irritating QRM at 145.930 that's confusing autotune (but it did capture more FC1 frames than my previous setup). I use 2 instances of the dashboard, each set to capture from the dongle, and each has it's autotune range set to either FC1 or FC2. The center frequency for both is 145.925. This seems to work for me.